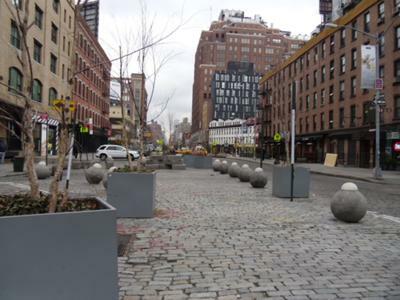 I noticed on a recent trip to New York that street closures had been implemented in a few places and that pea-sized gravel underfoot had been provided with chairs, tables, and sometimes landscaping and concession stands. This is most attractive; now it's hard to imagine that once there were that many lanes of traffic. Also in San Francisco there is a holiday allowing groups to turn parking spaces into parklets. Is this an emerging trend or a passing fad? I hope it's a trend. Editors' Reply: Yes, one of the contributors to this site lives in New York and jogs past several of these green streets. Street closures or partial closures have become common in Manhattan, as bus lanes, bicycle lanes, medians denoting truck loading zones, planting strips, every kind of plaza with or without seats, and even 45 degree parking are being approved by community councils. Truthfully, all of us think that the partial street closures, which also can be thought of as road diets or skinny streets or complete streets, are a step in the right direction. Many large cities, certainly including New York and San Francisco, have become too congested for pleasant driving. When transit is available freely and streets are walkable, other uses of former driving lanes are desirable. We've attached one photo of a plaza created in the middle of a former street or intersection. It's a bit whimsical, unexpected, and altogether very pleasant to encounter. The parklet phenomenon certainly is a San Francisco tradition by now. We haven't heard of too many imitations, but occupying some parking spaces with something more interesting is a useful beautification idea. Note that this technique can be done on a temporary basis and usually is. Pop-up parks can use potted plants destined for a charity fund-raiser the next day, and matched or mis-matched tables and chairs borrowed from homes and businesses. Maybe for a one-day event someone will loan you a striking piece of sculpture or part of a tree they have just cut down as a sculpture. Choose off-peak parking hours, of course, but in many places in cities, the parking lanes or even meters rarely are used. Visually interesting green spaces, public gathering or performance areas, and public art all make sense when streets and roads are too wide. Plazas without shade and seating make less sense, but then again, certainly the photo here is more stimulating than a wider expanse of asphalt. Be aware of potential backlash if you misjudge the potential of the narrowed street to handle traffic. However, in most cases, cars have more than enough room, don't you think?